I'm trying, what I thought would be simple, to wake a sleeping ESP8266 via motion detected by a PIR. 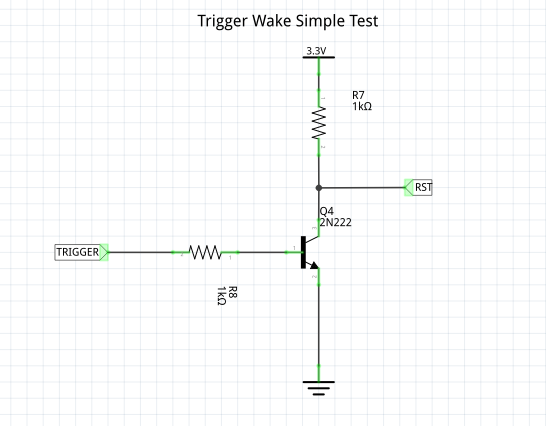 Where RST is the RST pin of the ESP8266 and Trigger is the PIR's trigger line. The problem I'm finding is that this is not working. 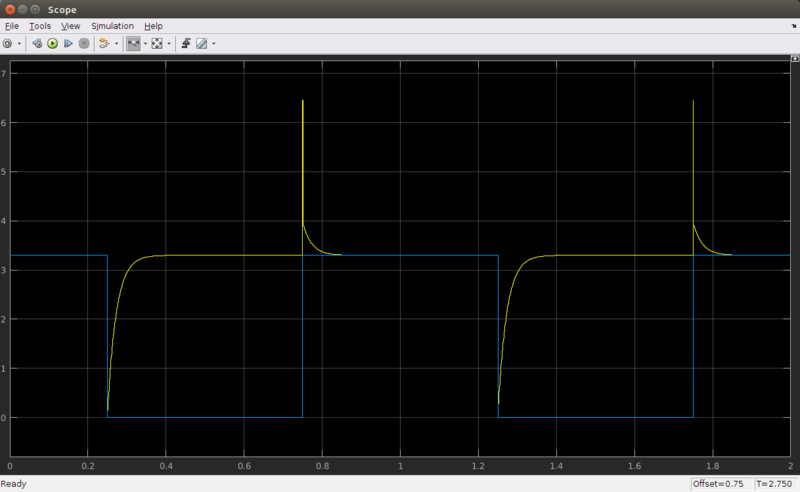 The PIR is working fine, and throws out almost 3v for 2 seconds when triggered and 0 when no motion is detected. My ESP is being woken up when the PIR trigger is OVER, not when it STARTS. So if the PIR senses motion for a long time, the ESP will only wake up when the motion STOPS. The PIR is one of these. The ESP is currently a NodeMCU on breadboard, but the final product will be a Wemos D1 Mini. What you need is an edge detector. As long as the PIR output is hight, the ESP stays in reset mode. 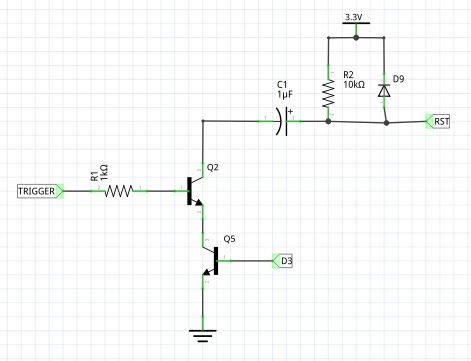 You can use a capacitor to do the trick, as shown in the following schematic. You'll probably want to get rid of the pull-down resistor R1 since you're using an open-collector output. At the instant when the collector voltage drops to (almost) zero, the voltage across C1 will be 0V, so the output is close to 0V as well. 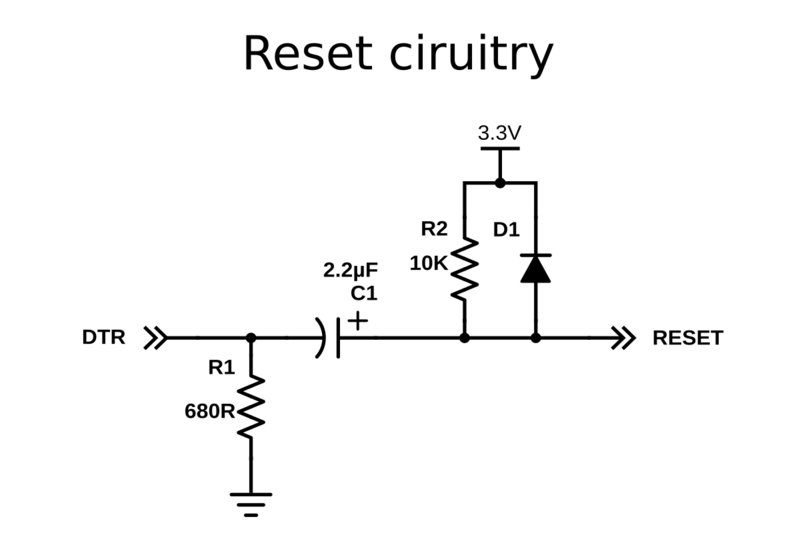 Then the capacitor immediately starts to charge through R2, so the voltage on the reset pin rises exponentially. To prevent a high voltage peak when the PIR turns off, a diode is used to discharge the capacitor more quickly. If the resistor at the collector is large enough, this might not be an issue at all. The same principle is used in the Arduino UNO, for example, to reset the ATmega when DTR goes low. Not the answer you're looking for? Browse other questions tagged esp8266 sleep or ask your own question. Why does my PIR sensor stay high with ESP8266 breakout board? 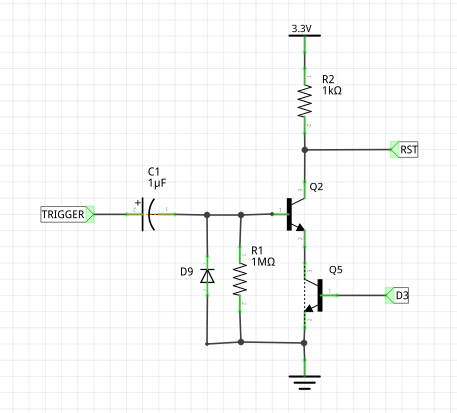 Can I use a 3.3v GPIO to control an opto-isolated 5v relay board?